My flight from Hong Kong got to Manila around 9:00pm local time and my flight to Dipolog did not leave for a little over 12 hours. I debated about what I wanted to do, and decided to engage in one of my hobbies; people watching. I had slept well on the airplane (Thank you Tylenol PM) so felt no need of paying for a hotel room to relax in when I wasn’t particularly sleepy. I had my Chromebook that I was taking for the children’s home as well as my smartphone and Kindle eReader. If I ran out of people to watch, I am happy with a book or in this case an ebook. I found a waiting area that also included a counter with quite a number of charging outlets for those that had electronics that decided to go “low batt” as they call it. I settled in with my Kindle to await whatever might show up. I saw people stretching out on any available flat surfaces. The smart ones had their heads under tables or benches or simply covered to block out the light. As the night progressed, some of the children began to get restless. I decided to have fun. I had packed a couple hundred balloons to make balloon animals for the kids at the children’s home. I started making dogs for the three children sitting ahead of me and as I finished one, I would hand it to each child in turn. It took brief moments for other children to start gathering around. A little girl, I believe she was 3 or 4 years old, came over to me and brought the back of my hand to her forehead in the traditional sign of respect to an older person. “Lolo, I help please,” she asked to be included. As I made animals I would hand them to her and she would take them to someone that didn’t have one yet. A security guard saw something going on and came over to watch. He was intrigued by the different animals. The little girl asked if I wanted her to give him one. “I’ll make a special one for him,” I told her. I had seen that he wore a holster for a revolver but had no firearm in it. I made a sword out of balloons and then went to him and making sure it was ok, put it in his holster. He and the children were all laughing. His supervisor came to check things out so I made him a bigger sword. He laughed and gave it to one of the boys and then left. As morning came, I heard rosters crowing. 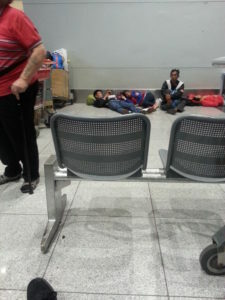 In the line for Cebu Pacific Airlines, there were a couple cages of roosters waiting for their plane ride. 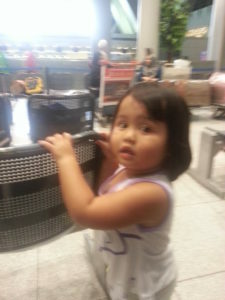 Carry on or checked baggage? I never found out. 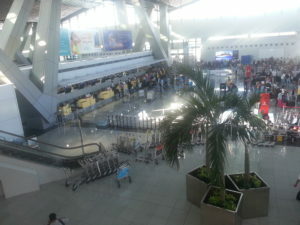 On my return, I had to go through the same terminal. 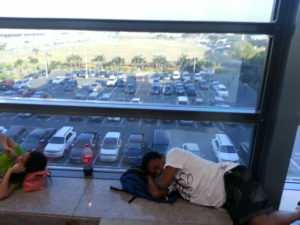 I had very little luggage and certainly nothing very valuable so I decided to find a quiet corner of the terminal and stretch out. I had a memory foam horseshoe neck pillow for my head, an inflatable pillow for my backside. 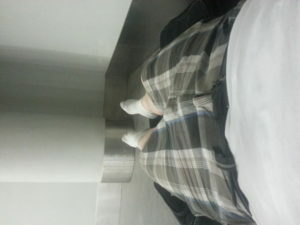 I draped my legs over the suitcase and put my neck pillow on my carryon bag. 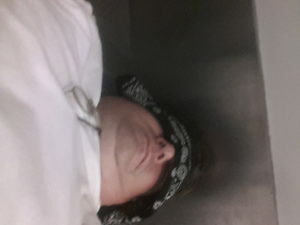 I put a bandana over my eyes and settled in for a nap. “No, thank you sir. I am just resting. Everything is fine,” I assured him. “It’s not good to do that.” He was concerned but we talked and I pointed out that I had counted almost 1000 people sleeping there so I was not worried. He walked off with comments of something like, “Crazy Kano”. I didn’t have a bit of problem and enjoyed my visit to what appeared to be Manila’s largest free hotel.